The White House has placed a strong emphasis on hands-on STEM education. The Administration’s priorities include encouraging the exploration of STEM subjects, encouraging citizen science, and fostering entrepreneurship by making tools need to design and build more widely available. These efforts can be seen in “Maker Faires” – which celebrate science projects, engineering, arts, crafts and the “Do It Yourself” mindset – around the country, an increasing number of maker spaces and online communities, more museums creating maker programs, and the growing access to tools such as 3-D printers and associated software. 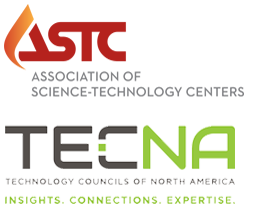 Along these lines, ASTC and the Technology Councils of North America (TECNA) formally announced the collaborative “Making it Real!” initiative in June 2014. This initiative is designed to facilitate more hands-on experiences at science centers and museums and to draw young students closer to the individuals and organizations that are the targets of their growing interests in science. Minds at Work: In collaboration with science centers, local technology councils help identify individuals who can join local science centers in Maker workshops and DIY events to inspire creative thoughts about Maker projects and provide examples of where these projects can lead. Tour the Floor: Local technology councils and science centers help organize visits of young Maker event participants to visit local companies for “walk-arounds” and/or meet-ups with science-focused employees. Meet the Innovator: Science centers and museums work with local technology councils to identify innovators who will present the science behind their work in museum events open to the public. Educator/Innovator Showcases: science centers and local technology councils convene workshops jointly with local university representatives with case studies of the pathways from education and research to entrepreneurship and application. Convene to Inspire: Science centers and local technology councils identify opportunities for companies (or the tech councils themselves) to convene retreats, board sessions, or other professional meetings at science center and museum locations, reinforcing the “science” of these enterprises. Joint Programs: ASTC and TECNA work closely to ensure that science centers and local companies collaborate in responding to solicitations from programs such as the Small Business Innovative Research Program (SBIR), Small Business Technology Transfer Program (STTR), the Small Business Investment Company (SBIC) program and its Early Stage Investing and Impact Investing initiatives, DOD recurring solicitations, etc, where emphasis is placed on fostering hands-on STEM education. Joint Advocacy: ASTC and TECNA join in advocating for greater and more appropriate resources to advance innovative enterprise, incorporating opportunities and resources wherever possible for accompanying hands-on STEM education. Joint Promotion: ASTC and TECNA use the occasions of respective annual conferences and local events to highlight the successes of this cooperative venture and new opportunities on the horizon.